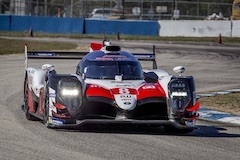 Toyota City, Japan, Mar, 08 2019 - (JCN Newswire) - TOYOTA GAZOO Racing resumes its 2018-2019 FIA World Endurance Championship (WEC) season following the winter break with its first-ever visit to Florida, for the 1000 Miles of Sebring. Another one-two victory in Shanghai in November ensured TOYOTA led both the drivers' and teams' World Championships going into the four-month winter break and the team returns to action at Sebring determined to extend that advantage with a fifth win of the season. In the #7 TS050 HYBRID, unlike team-mate Kamui Kobayashi who is a Sebring rookie, Mike Conway and Jose Maria Lopez have both raced previously at the track, with Mike earning an overall podium for third place finishes in the legendary 12-hour race in 2017 and 2018. This month's WEC race in Florida will run within the same event as the Sebring 12 Hours. For the first time ever, a WEC race will take place on a Friday, with the 1,000 miles to run from 4pm to midnight local time prior to a Saturday morning start for the IMSA race. As well as a unique timetable, the team must also adjust to a different pit lane. In common with endurance racing across the Atlantic, Sebring features an 'American wall' concept that, unlike typical WEC venues, features a wall to separate the garage area and pit lane. To prepare for this, TOYOTA GAZOO Racing mechanics have practiced in Cologne with a mock-up of the Sebring pit arrangement. "Sebring is the start of the final part of the 2018-2019 season so we have an important three races ahead of us with a clear goal to secure the World Championships and win Le Mans again. This will be our first time to race at Sebring and I think this is an exciting challenge for the team and drivers. I have heard so much about the special atmosphere there so I cannot wait to experience it for myself and I hope we can give the American fans an exciting event." "Going into Sebring my expectations are high. We would like to keep up the good run of form we have had in #7, which means continuing to score well and win more races. Sebring is going to be a challenging one because it's a new track for the team. I know the circuit well from IMSA racing and testing in IndyCar. I hope that my experience there will help the team to speed up the process and get the car into a good window. I'm looking forward to going back there and earning a good result." "I am getting more familiar with racing in the US after my Daytona 24 Hours experience and I really enjoy it so Sebring should again be fun. It was interesting to experience this old school track during our test last month; it is bumpy and the walls are all pretty close. I enjoyed it because it is a nice challenge for a driver and it's a track that doesn't allow you to get away with any mistakes. It will also be a big challenge with the traffic so it should be an exciting race." "I have nice memories of Sebring because I drove my first-ever endurance race there back in 2007 when I participated in the 12-hour race in a GT car. I hadn't been there for a while before our test, which helped us all to get familiar with the car on this track. It was amazing; there are not many run-off areas, the average speed is high and then you have the bumps. I enjoyed every lap and am really looking forward to racing there." "We had a good test at Sebring and I really enjoyed the track. We had never been there before with this car so it was important. I really enjoy the lay-out; it is very challenging especially at night because the track lighting doesn't help much. I have good memories from my previous race at Sebring in IMSA; it was a cool event. I am looking forward to a strong race. It will be challenging because it is longer than normal but hopefully we will be strong and can fight for the win." "I have been looking forward to racing at Sebring since the calendar was announced. It will be my first time there but I have heard a lot about this track and the American fans. It was helpful to test there a few weeks ago; this means we are now familiar with the demands of the track and we already have a good feeling for the set-up. It's been a long time since we raced in WEC and actually our last win in the #8 was at Le Mans so we are really determined to stand in the middle of the podium again." "Daytona was a fantastic experience for me; to win at such a classic circuit was really an honour and I hope we can do the same at Sebring this month. I really feel at home with the American fans, who are very passionate about motorsport. Like Daytona, Sebring is a unique circuit and it was amazing to drive there for the first time during our test. It will not be an easy race for the car or the drivers, so we have to prepare correctly and execute the race perfectly again; we are pushing hard to win."